Alban, Daphné and Marie-Hélène on the ride that was the children’s favorite, called the Big Thunder Mountain Railroad by the Disney Imagineers, and the “train fou,” or runaway train, by our children. “To all who come to this Happy Place, welcome!” Walt Disney used those words when he opened the original Disneyland in Anaheim California in 1955. He could have been talking to us. He was talking to us. We started going to Disneyland Paris, then called Eurodisney, almost as soon as we all moved in together in 1994, and it has always been such a happy place for us. Look at the expressions on our faces! In the photo above, Daphné, Marie-Hélène and Alban were on the “train fou” early in 1995 (others of the same ride are here) during our visit to celebrate Grandma‘s birthday with her. 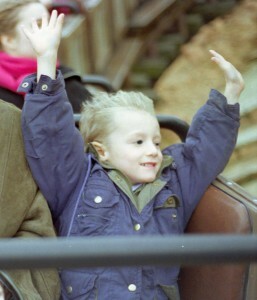 It was the favorite ride for all of us for years. The view across the lake to the “train fou” on its way. We could sometimes make out the children as they rushed by. It went by very fast, in the blink of an eye, it seemed. We developed the habit of visiting the park on wet or cold days, not to suffer the privations of a Parisian winter, but because there were fewer visitors on those days. There were not a whole lot of visitors in any event, because the park had only opened for business a couple of years before, and was initially viewed by the French as something like a McDonald’s, an unwanted penetration of the American empire into France. 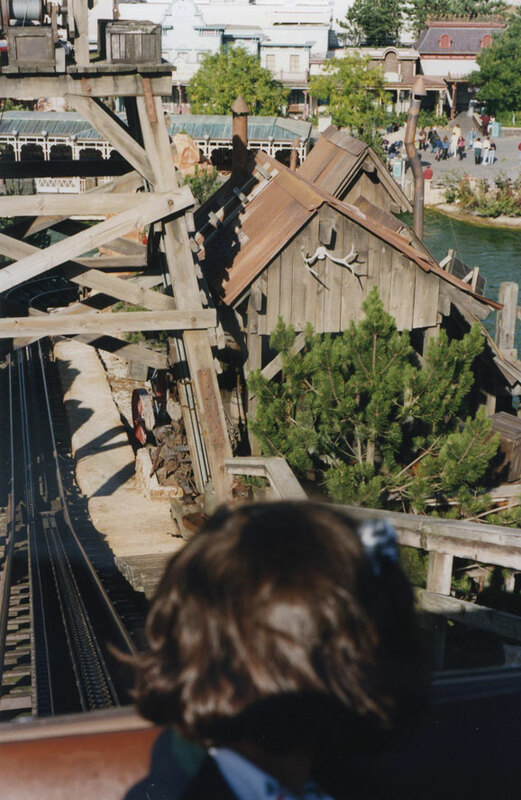 As a result, the lines for everything were shorter in those early years, except for the lines for the “train fou,” which were normal, because it was always such a great ride. Except they too were shorter on wet or cold days, and at times by the end of the day there were no “train fou” lines at all! 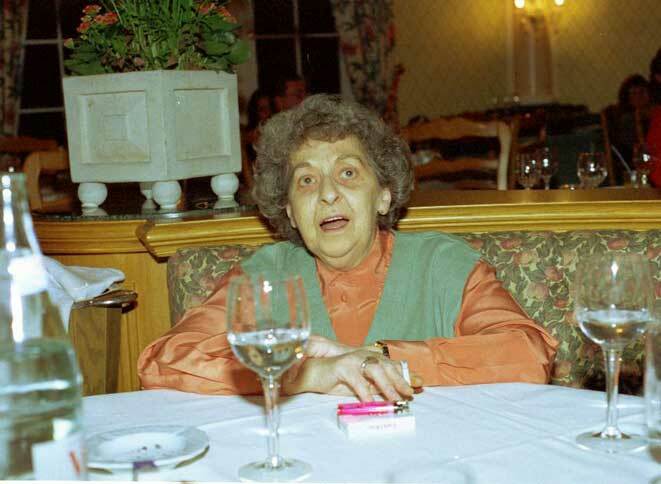 Alban was five years old in January 1995, when this was taken. He proudly held up his arms, as his big brother and sister did. On days like those, the parents would stand in a little space off the path next to the lake, smoking a cigarette or looking after Charlie (after he arrived in August 1995) or simply passing a peaceful moment together. Keeping up with the children and doing what they wanted all day, while ensuring that we all ate and stayed warm, did take a little effort. Interludes of peace and quiet were definitely desirable. The ride crossed the lake in a tunnel, and then resurfaced on land across the water. From our vantage point, we could watch it in the background. This particular path was on the way from the ride’s exit back to the park or, if you wanted, back to the start of the ride. Of course, there was typically a wait to get back on the ride. But the wait was reduced on these wet or cold days, and there was often no wait at all by the end of the day. Grandma turned 68 on this birthday, one of her last trips (maybe the last trip) to visit us all in France. She’s sitting in the California Grill at the Disneyland Hotel, looking at an arriving plateau. . . The parents stood and chatted for maybe five or ten minutes for each ride that the children took. Typically it was a quiet time, with dusk falling and the crowds of the day making their way, almost subdued now, out of the park. Then a little whirlwind of four small children would race past us, racing against the rest of the crowd disembarking, racing against each other, and racing back to the start of the ride. 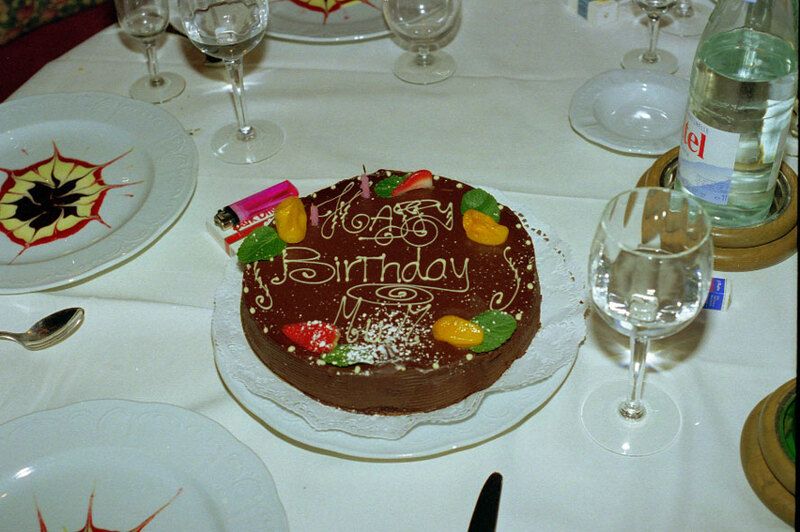 Daphné would squeal as they all ran by, Nick would shout out instructions, and Alban and Tom would laugh and laugh and laugh.
. . . on which was a birthday cake. It was the cake which evoked her look of surprise in the above photo. It said, “Happy Birthday, Missus,” the pet name that she liked us to use for her. This could happen eight times, ten times on the trot. Race, squeal, shout, and peals of laughter, again and again. We would want to leave: an hour standing in the same place and waiting for them would get boring, even if it was fun watching them race by us; or maybe the park was going to close soon; and in any event we had an hour’s drive home. But we barely had the heart to stop them. There was so much unadulterated glee, so much pure happiness in all of our children racing again and again around their “train fou.” We would simply watch in awe, quietly pleased with ourselves. Parents of small children enjoy little more than seeing those children visibly, audibly excited and happy and full of life. It can’t last for ever, we all know, but while it can, let it go. Looking back down the tracks of the “train fou.” Daphné is looking back too, perhaps looking for her maman with Charlie in his pushchair. 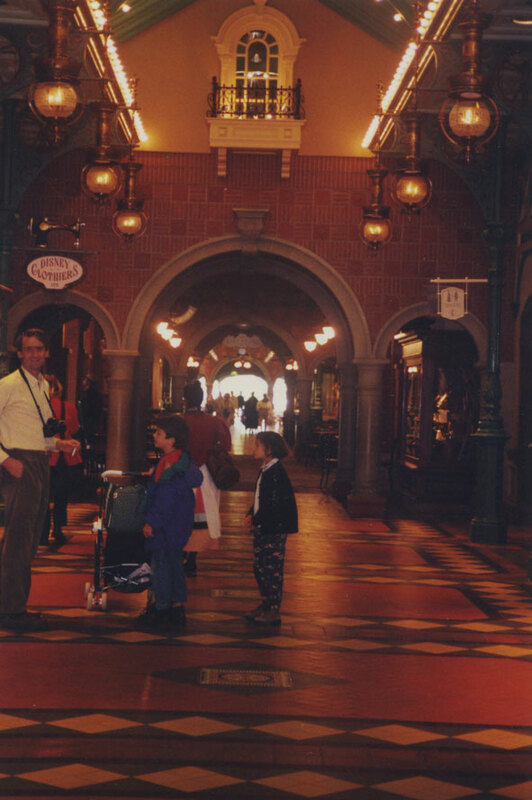 Ours was a family that came of age, so to speak, in Disneyland in Paris, thanks to Grandma Stock. When Marie-Hélène and I moved in together in a village in the Forest of Rambouillet, each bringing a pair of rather confused and unhappy children, all hell was breaking loose all around us, and more importantly, all around the children. Pierre and Sunshine, the respective prior relationships (her and his exes) both went crazy, financial problems reared their heads, the kids expressed and emoted (duck! ), and even the tax authorities seemed to embark on a vendetta. Into this psycho-social chaos rolled Ian’s mother, whose continuing ill-health obliged her to spend much of her time in a wheelchair, and off we went. 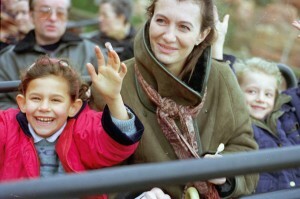 She invited all of us (first we were six, and after Charlie arrived seven) to stay with her at Disneyland outside Paris. The Disney “Imagineers” did make concessions to the seasonal climate in Europe. There were roaring fireplaces during the winter months in many of the restaurants and hotels, and there were these arcades behind each side of main street. This was taken on September 12, 1995, during Charles’s first visit. She only managed to accompany us there once, maybe twice, because of her deteriorating health and because the trip between Marlow, where she lived, and us outside of Paris became harder for her. But she saw instantly how much the children loved it there, and how good it was for us all to be there. So she offered us all annual passports, for two years running, maybe longer. We could go any time we wanted (no blackout days then), and all it cost us to do so was the gas for the trip and our food while we were there. The park became an oasis for us, the eye of the hurricane which we lived in those early years, a hurricane made up of dealing with blending families and the parental conflicts outside the gates. It remained an oasis until we left France in June 1997, and we visited again and again. The beginnings of this family were cemented at Disneyland in more ways than one. I asked Marie-Hélène to marry me in February or March 1997 on the “train fou.” We had both lived enough already to know that life itself is one long roller coaster, and I liked the symbolism. We both loved the ride. 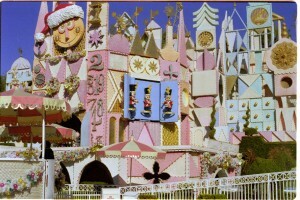 Disneyland had become one of “our” places, and there was a good chance that she’d be feeling good. 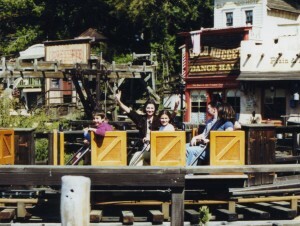 Here are Marie-Hélène, Daphné and Tom on Big Thunder Mountain Railroad at the original Disneyland in Anaheim in April 1999. She was! I Put my arm around her shoulders, and put her the question. 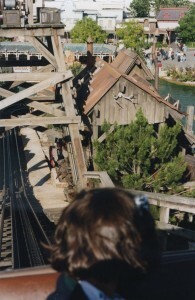 Well, I actually had to yell the question in her ear: Big Thunder Mountain was pretty loud in full flight. There may have been a slight failure there on the romantic front, but hey, I’m English, what do you expect?! I thought that she replied “oui” as we raced down a steep roller coaster hill and around steep roller coaster turns, but it could have been ‘wheeeeeee!” How can you tell the difference, in the middle of all that noise and bouncing and excitement? Later, I would wonder if somehow she managed to marry me without actually saying yes first, but we certainly did get married! Disney’s decor, especially in Paris, makes a mockery of the competition. It’s a Small World! Needless to add, this was taken in Anaheim! Sadly, when we tried to purchase a plaque to be installed in a new wall or floor in Disneyland in Paris recounting this romantic little story, the park’s managers turned it down, apparently finding it risqué. No way, guys! Just a little harmless fun! 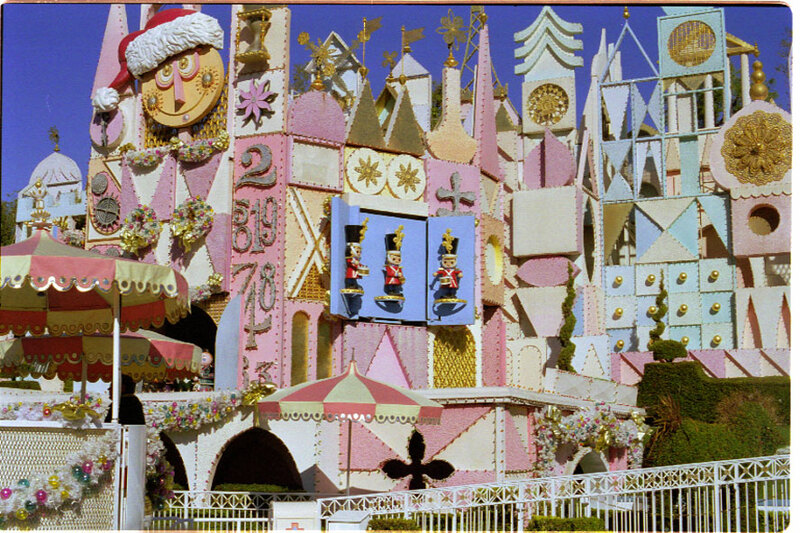 Whatever was going on in that nasty world outside, the beautiful decor and painstaking attention to every detail, not forgetting the best rides that “imagineers” can come up with, were a little, easy-to-reach sea of gaiety and frolics. Here, at least, the children were able to be children, and how! More Disney, this time the residents. And more rides. Not forgetting the decor. 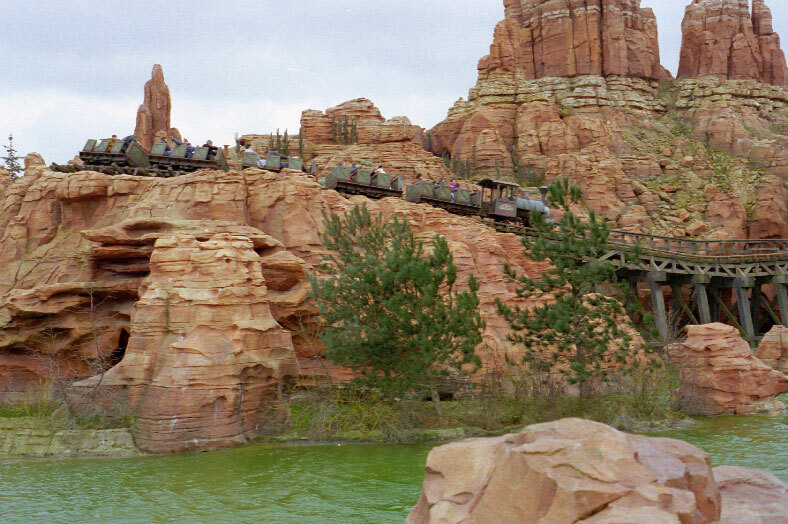 There is a picture of full size Western American cousins of the “train fou,” here.